Mikado Rygamine, a young boy who longs for the exciting life of the big city, moves to Ikebukuro to attend Raira Academy with his childhood friend Masaomi Kida who he has not seen since he was young. After the two meet at the train station, they set out at night to the streets of Ikebukuro. Masaomi warns Mikado about people he doesn't want to cross in the city such as the violent and superhumanly strong man Shizuo Heiwajima, the information broker Izaya Orihara, and the mysterious gang known as "The Dollars." After running into some of the side characters, Mikado sees a local legend called the "Black Rider" who rides around Ikebukuro on a black bike that occasionally neighs like a horse and who is rumored to have no head under her helmet. The "Black Rider" is Celty Sturluson, an Irish dullahan who is in Ikebukuro looking for her stolen head. The narrative follows all of the characters equally, showing how their lives intersect and creating a greater plot line from what each character knows about a common incident. The story is told from the perspective of eleven or so of the main characters changing every episode in the anime. However the narrator is not always the episode's one and only character perspective given. 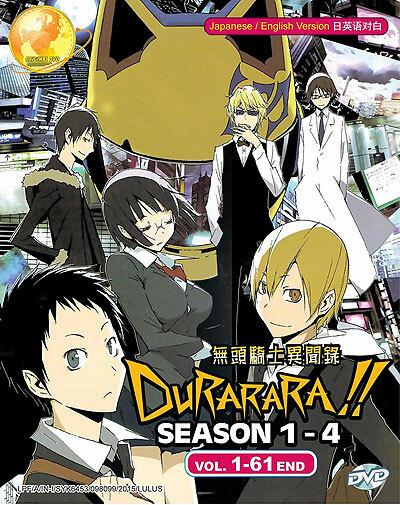 One of the few constants given in every episode is that the narrator gives his own opinion on the current situation that they are in, as well as certain things that make them tick and keep them going in Ikebukuro, a city with a large underbelly that is the medium for the majority of both the plot's development and random violence throughout the series.